I downloaded a latin / reggae / edm template for Logic Pro. I really like the beat, but I'm trying to understand it better. The creator didn't tell me anything about the key or time signature, only that it's 110 bpm. 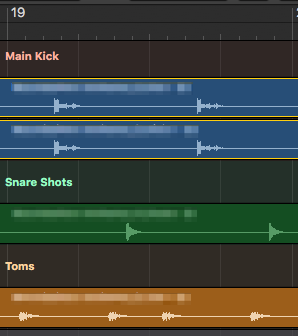 I've simplified the beat down to just the kick drum, snare shot, and toms. Here's an screenshot of just one measure with the three instruments in my DAW (they are just raw audio files). Anyway, if anyone has more insight this type of beat and if there is some name for it then please share the knowledge. thanks. You can listen audio to audio files here for one measure and here for 4 measures, and also versions with the metronome here and here. As Tetsujin wrote in the comment, the thing looks misaligned. Listening to the beat by itself, the most straightforward interpretation is: alternating bass and snare, with the tom on the sixteenth before the snare, and on the eighth between the snare and bass. The rhythm has a reggaeton / calypso flavour to it. In my interpretation of the rhythm it's a straight 4/4 time signature. However the one of the rhythm has been shifted to the end of every sixteenth note. Not the answer you're looking for? Browse other questions tagged rhythm drums daw or ask your own question. What kind of acoustic guitars are good for rhythm playing?